At Saronggi district there is a home industry of making Keris (a wavy double bledded dagger). This home industry is in Aengtongtong village, about three kilometers to the west and two kilometers to the north. Keris is a kind of dagger believe to have magic power. Therefore, in the last time, not all people could make Keris except a man called Mpu (Master Keris Maker). 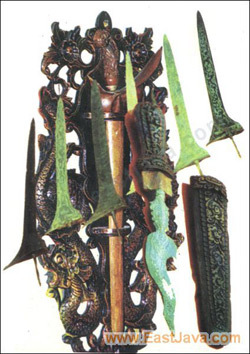 It is now regarded as usual dagger but because its form is unique and interesting, many people have impressed to Keris. The Aengtongtong Keris product has been sold to the big cities in Indonesia like Surabaya and Jakarta. It has also been sold to other countries, such as; Malaysia, Singapore and Holland. Besides visiting Aengtongtong village to see Keris home industry, one can also go to see Nyadar Traditional Ceremony in Kebundadap village, Saronggi district. It is a traditional ceremony held to celebrate the villager's ancestor named "ANGGOSUTO". He has been regarded as a man who firstly found the way of producing salt through traditionally way. He tought the villagers how to process the sea water to be salt. Because of his merit the villagers always memorize him by helding ceremony called "NYADAR". Madura is also popular of its Batik. One of Batik home industries in Madura is Batik " Melati " from Pekandangan Barat - Bluto sub-district Sumenep Regency. Pekandangan Barat is a center of Batik Home Industry located about 10 kilometers north of Sumenep. It is easy to reach for it is sited about 100 meters from the road on the way to Pamekasan regency. Madura batik has different characteristic to Java's especially its colour. Madura Batik has usually a clear and strong colour like red, green and yellow with bird, flower and dragon as the motif. 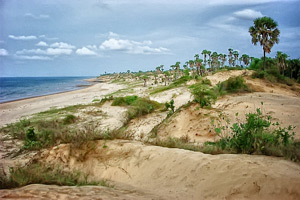 Pragaan district is about 25 kilometers north from Sumenep town. Here one can find the center of wood carving. It is also a home industry that produced by Karduluk villagers. Karduluk wood carving has a unique style and different colour if compared to Java's. Its colour is clear and strong like red and green, and it often describes bird, flower and dragon as the motif. Its style and colour reflected the influence of China culture. A special dance performed to welcome the guest. Muangsangkal derived from the two words " Muang and Sangkal ". Muang means throw away and Sangkal means unluckiness. This dance depicts the hope of Sumenep people in order they are avoided from disaster. Muangsangkal dance is always played by odd people, it can be five, seven or nine. The traditional costum with strong color like red, yellow and black show its Sumenep characteristict. Mask dance is a traditional dance played dancers with used mask. It is actually a traditional drama of which story often taken from episode of Mahabharata. This dance is usually performed a few minutes before the bullrace competition started to give some opening event to the audience on so that the bullrace competition will be more and more interesting. This dance is played by about 100 dancers consist of boys and girls. The traditional music called Sronen and Thok-thok sounded to go together with this dance.